Join Canada's Leading Identitarian Movement! ID Canada is an ethno-nationalist and Identitarian youth movement inspired by Generation Identity’s impressive headway in Europe. ID Canada has existed since 2014. First as Generation Identity Canada, and then re-branding into ID Canada early this year. With the name change, a new leadership team was tasked with crafting an organization unique to Canada. 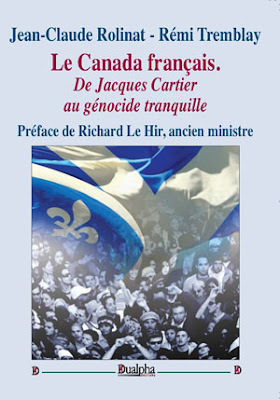 The vision was to create an Identitarian ethno-nationalist movement in the spirit of the Canadian cultural reality. We fight for the expression our own distinct identity. Old Stock Canadians now face an unprecedented challenge. By 2036, StatCan predicts that half of all Canadians will be children of a first generation immigrants. Considering the demographics of those we let into this country, we can safely assume that a Euro-Canadian minority will follow shortly thereafter. We must ask ourselves, is this the “Canadian dream” for which our ancestors sacrificed everything? Is this the Canada for which our fathers died? Do we honestly expect our values, culture, traditions, languages and customs to remain unchanged? We're already seeing the negative effects of diversity and multiculturalism today, when Euro-Canadians have yet to become a minority. If we want a startling glimpse of may come to pass, we should look no further than South Africa. The multicultural experiment has been a failure. Our founder’s dreams of enjoying a safe, prosperous nation shared by the people of Europe has been poisoned. In its stead, a painful nightmare of European peoples being eradicated in their homeland. However, globalists overlooked a few obstacles - our perseverance, our pride, our honour and our discipline. There isn't a more resilient people in the history of mankind. We Europeans have faced countless invasions through our long history; we've even fought bloody wars against one another. However, Europeans have always come together to fight a common enemy. From the Winged Hussars aiding their Austrian brethren in the 1683 Battle of Vienna, to the nations of Europe unifying together to retake the Holy Lands in the Crusades, there's no shortage of examples to showcase our ability and willingness to fight together. Fast forward to present times, and all across the western world there's a wave of nationalism, unity and brotherhood sweeping our nations. The fight has been going on for decades, and up until recently, the only people battling were our enemies. Euro-Canadians are now realizing that multiculturalism and diversity simply mean the lessened presence of our people. The establishment is determined to discredit movements like ours as “racist, xenophobic and bigoted”, but this could not be further from the truth. Euro-Canadians are beginning to realize that this has nothing to do with a loathing for others, but rather a love for our own. A love for our people, our languages, our culture, traditions, customs, and most importantly, our identity. Every other ethnic group is not only permitted but encouraged to show boundless pride in their identities. Non-Europeans express confidence in their peoplehood while being championed by the left as civil rights advocates, heroes and visionaries. When Europeans attempt the same, accusations of racism, bigotry and Nazism are soon to follow. It's time to break the shackles of “white guilt” and re-instill a sense of dignity, honour and meaning into the hearts and minds of our youth. We're made of the same desire for greatness that ran through the veins of our fathers and mothers. We've simply been conditioned to suppress it. The time for action is now. ID Canada has chapters from Prince Edward Island to British Columbia. We're coast-to-coast, and together we will fight against the relentless waves of cultural Marxism, liberalism and the attempted erasure of our identity. ID Canada seeks real-world activists. We take quality over quantity, and have a very strict vetting procedure. To join, consider submitting and application. Note that after some experimentation, a $15 fee had to be enforced. This is to deter spam, bots and individuals seeking to infiltrate. Once we review your application, we will proceed with a brief voice interview, followed by an in-person meeting with one of our regional leaders. These steps are to safeguard the integrity of ID Canada and ensure we are working with people who are truly inspired to effect change. Once the vetting process is complete, applicants are granted initiate status and must partake in activism campaigns and attend meetings to become a full member. ID Canada does not condone illegal activities, and will not accept applicants who we feel do not meet our criteria. Our membership is currently limited to applicants aged 18-35. If you wish to help but do not meet the requirements or don’t want to join at the moment, consider becoming a Patron.